The holiday season is just around the corner and if you are like me, the thought of "who to get what" is on your mind. A Signing Savvy membership is a unique, thoughtful, and valuable gift to offer to your friends, family, or colleagues. In the last few years, we have received numerous requests for the ability to purchase Signing Savvy Gift Memberships. Well, now you can! When you purchase a gift membership, you will receive an Activation Code (and activation instructions) that you can email or print to include in a card or wrap up as part of a gift. The receiver of the gift will be able to use the Activation Code to gain full access to all of the Signing Savvy features. The gift membership will begin once the gift receiver activates it. The gift that gives back. Similar to our recommendation program, as an added bonus for purchasing the gift and giving it to someone else, you will receive time toward a full membership in return! How does it work? If you already have a full membership, the time will be added on to your membership. If you don't yet have a full membership, you will once you purchase the gift. The more gifts you give, the more you receive. *** NOTE: You do not receive the bonus days if you gift the membership to yourself. Get your shopping done early! Purchase a Signing Savvy Gift Membership today and give the gift of signing. 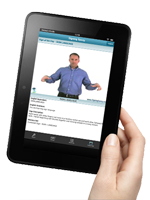 We launched Signing Savvy in January 2009 with the goal of creating a comprehensive online sign language resource. Over the last four years the site has grown dramatically in content, features, and usage. We are so grateful for the support of all of our active users. It is you, our users, that make Signing Savvy so special. We particularly are thankful for our full members who allow us to continue to grow and maintain the site and enhance its features. As we celebrate the end of our fourth year, we are thrilled about the things to come in 2013 and beyond! With that said, we are excited to announce that a new version of the Signing Savvy Member App for both Apple iOS devices and Android devices is now available. This long anticipated update addresses all known issues with the previous version, enhances the interface, adds additional sign information, and allows for searching of dates, times, and currency. And, most notably, the app now takes advantage of the iPad, iPad Mini, iPhone 5 Retina display, and Android tablet display if you are on one of those devices. The Signing Savvy Member App is for Signing Savvy full members. If you are not yet a full member, you can still use the app to easily check the Sign of the Day on your mobile device. Happy Birthday and thank you, Signing Savvy. This site is clearly a labor of love and the result of a true passion for spreading this beautiful language. As a professional educator, I want to say your service is impeccable. As a student of sign language, I want to say I could not do without Signing Savvy. Best wishes for a very long and successful future. I found your website simply by accident while looking up a word. My primary language is sign and now have incorporated it into my business but discussing something with my brother in law we had a bit of an arguement and thought maybe you could assist. I tried explaining to him that there could be one sign for multiple words however he doesnt think this is true. I am 44 years old and have been around the Deaf community my whole life where as he has only been part of the community for the past four years. My question to you is, how would you explain to a hearing person the way the Deaf communicate? Ive tried and it goes on deaf ears. As you know, the Deaf do not communicate the same as a hearing person simply becasue they do not hear words on a day to day basis. I would appreciate any words of wisdom from your experience dealing with this for many years. the best way ive been able to descibe that signs have more than one meaning to hearing people is to think of synonyms, mulpliple words to say the same thing. In ASL its reversed, one sign to say many things, but those many things are usually synonyms. there is also a blog post back in december that described this kind of situation. he should really take a college ASL course or two. ASL 1&2 both get into the basic "rules" of ASL, like HOLM, tenses, word order, ect. Hello Karen, I think I responded to you personally but thought I would add it to the site as well so that others can see the answer. Benjamin is correct also with his response. There are many words that can be represented by one sign. Because of this, one has to always consider the context of the sign in order to understand the true meaning. There are also signs that may look like one sign but can actually be translated in English as a sentence. Gestures are also a huge part of sign language so they are often used in a sentence and are not exactly a sign, but definitely convey a meaningful part of the communication. This video gives a brief overview of the Signing Savvy service and the inspiration behind it by one of the Signing Savvy founders, John Miller. In addition to his work on Signing Savvy, John has been a teacher, educator, and administrator at the K-12 and University level. His focus throughout his career has been on Deaf Education and working with Deaf and Hard of Hearing children and their parents. Over 90% of deaf and hard of hearing children are born into hearing families. So that statistic alone is shocking for a lot of people to hear. But what that means is that over 90% of the children are coming home with a family that sign language is not their primary language. People often ask me how it was that I got my start in sign language and where that interest came from. When I was a teenager, 12 or 13, and babysat for three little girls that lived across the street from me. And they were very close together in age, one, two, and three. The mother picked up pretty quickly that the middle child, the one that was two at the time when I started with her, wasn't responding and wasn't picking up the language that her sisters were. So after they did some testing they found out that she was in fact severe to profoundly deaf. And me as a twelve year old boy didn't really know how to help other than I wanted to. So one thing that I could do is go to my local library and look for a sign language book. And I did that and learned the whole book really quickly and I took it back and tried to work with the little girl and work with the mom and get them to understand. And it was just a really neat experience for me to see that little girl for the first time in her life pick up on things and realize that there was a word for things and a way to ask for things and a way to communicate. So I really quickly learned that this was something that I really wanted to do with my life at a pretty young age. The beauty of Signing Savvy to me is that it started out as this one vision (an online Sign Language Dictionary) but with everyone else who has jumped on board with it we have turned it into something that was beyond what any of us ever thought it could be. It is so much more than just a book that you just open and look at a sign and go, "I think it is like this." You can actually click on that picture and you can see it come to life. It is so much more comprehensive and so much more inclusive than what a book would be. I wanted something that could be a communication tool between school and home. A teacher can take the printing feature option and they can, after creating a word list of, let's say they are talking about vegetables in the classroom that week, they can create word lists of all the different vegetables and actually print those signs off onto cards that are sent home with the student. The children can sit down at the computer actually and be able to go through quizzes and (digital) flash cards and things like that they can do that study vegetables and then be able to go home and access that same teacher's word list. We know that language cannot begin and end in the classroom. It has to continue on with home too. It is the parent's responsibility to do that in the home setting. It is the teacher's responsibility to do that at school. And it is everyone's responsibility to make that all mesh together enable to give our children the best opportunities possible. I knew that there were other people out there that used sign language that were not necessarily deaf or hard of hearing but I did not realize to what magnitude it was. And I did not realize the outpouring of "thank you"s that we would get from people out there who stumbled upon our site for some reason or another that are so thankful because we have given them a voice - the people who have children with down syndrom, the people that have children with cognitive impairments, and, you know, the adults, I have a really touching letter from a young man who is in Afghanistan and lost his hearing from an accident there. And he said, "I did not have a voice, and you gave me back a voice." We have the opportunity to make changes, to give children, adults, anybody who wants to a voice, a way to communicate that they may not have done before and it is exciting. It is exciting. And that is my passion. That's what I wanted to do (with Signing Savvy). It is so much more and so much deeper that I even thought was possible, but it is extremely rewarding. Inspiring for families and teachers alike! This video is so inspiring. 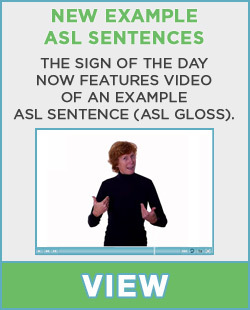 You've created an e-learning tool that is useful not only for children and families who are learning ASL. It's the best tool I've found for general curriculum and special education teachers who are suddenly faced with a child who communicates in ASL and who need to learn and integrate ASL quickly into their daily classroom interactions. Thank you for contributing so much to the signing community! From all of us at Signing Savvy, we wish you joy and happiness during this holiday season and all the best in 2013!